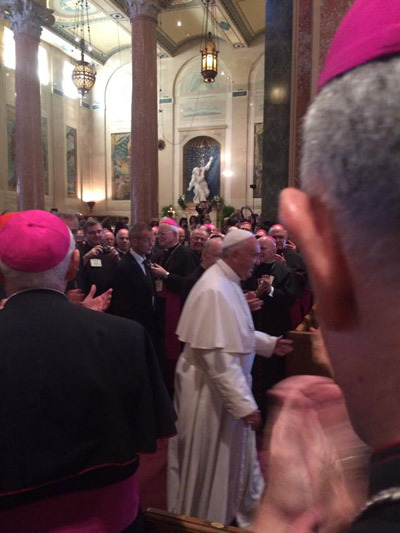 POPE FRANCIS PASSES Bishop Edward B. Scharfenberger's pew at St. Matthew's Cathedral in Washington, D.C.
"The pope gave a shout-out to Dorothy Day and the Catholic Worker movement!" That was exclaimed to us in phone calls and emails during Pope Francis' Sept. 24 remarks to the U.S. Congress. While it's clear that Pope Francis is a fan of Dorothy Day, Catholic Workers are big fans of Pope Francis. His simplicity of lifestyle, his humility, and his commitment to justice and peace sustain and inspire us in our Catholic Worker efforts in the Albany Diocese through Emmaus House. I must plead "guilty" to not watching or listening live to the pope's remarks to Congress while folks were calling us with the joyous news that Dorothy Day was mentioned. We at Emmaus House were trying to figure out how to help several immigrant families -- with health care, housing and legal needs. We were also gardening in our inner-city plots, which previously had been vacant lots used only for drug dealing and trash dumping. And we were delivering groceries to low-income families...taking families to medical appointments and translating for them...and trying to figure out how to pay the bills while relying exclusively on donations, and how to raise our own family in a poor, inner-city neighborhood. So much of Pope Francis' message is summed up in the Letter of St. James, which has been proclaimed during our recent Sunday liturgies: "The fruit of righteousness is sown in peace" (James 3:18). Both Pope Francis and St. James offer strong criticisms of people living with great wealth while there is tremendous poverty and low-wage workers are mistreated. What are we to do? We can look to the communion of saints -- holy women and men, like St. Francis of Assisi and Dorothy Day, whose daily lives are filled with great joy while serving and living among people who are poor. Are we willing to change our lifestyles? Are we willing to share more than just our leftovers? Pope Francis invites us to explore our motives and to ensure there is consistency between what we say and how we live. As St. James observes, if we say, "Go in peace, keep warm and eat well," but we do not give them warm food and clothing, then "What good is it?" (James 2:16). As the cool weather approaches, I will let you in on a little secret known to many church thrift shop workers. During October, people will be donating bags of summer clothing as they make room in their closets to switch to fall and winter clothes. But do church thrift shops really need summer clothing in October? Since opening Emmaus House in 1996, no person has approached us in October and November for shorts, tank tops, a bathing suit or flip-flops. They want sweaters, winter coats, hats and gloves. When I was in third grade, my Catholic school sponsored a canned food drive. Every day, I arrived with as many cans of food as I could carry in my bookbag. I decided that I would secretly clear out the food in my family's pantry that I could not stand to eat: mushrooms, beets, waxed beans. Sister Patrice was overjoyed with my daily bounty of donations. My mom, meanwhile, was confused by the gradual depletion of our food supply for our family of seven. And I felt good for avoiding another meal with canned beets while being rewarded with grace (or so I thought) for my stealth philanthropy. Are we really helping poor people when we donate summer clothes when it's cold out? Was I being altruistic when I donated food I found displeasing? To what extent do we donate at a personal sacrifice -- or do we expect something in return, like a pat on the back or a tax deduction? As co-founder of the Catholic Worker movement, Dorothy Day invites us, as followers of Jesus, "to comfort the afflicted and afflict the comfortable." During his visit to Washington, D.C., New York and Philadelphia, we got to witness Pope Francis living this message in our midst. Let us carry on his message by comforting others at our local parish food pantries, through Catholic Charities programs -- and, of course, your local Albany Catholic Worker community at Emmaus House. Let us prayerfully discern -- and act on -- ways we may become less comfortable.